Combining the simplicity of our VK10 with the power of a concentric search coil the VK10+ is a perfect detector for those that want performance without complexity. 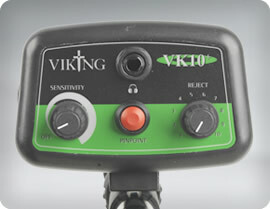 Primarily a motion detector the VK10+ will give a sharp signal on deep targets, but also features a pinpoint mode to aid locating where the target is buried. The discrimination control allows unwanted targets to be rejected and the sensitivity control ensures maximum performance from the detector in all conditions. For the more advanced user an option to adjust the ground balance is provided to eliminate false signals. The VK10+ is a perfect choice for beginners wanting a powerful detector or experienced users who just require a simple, yet effective machine.